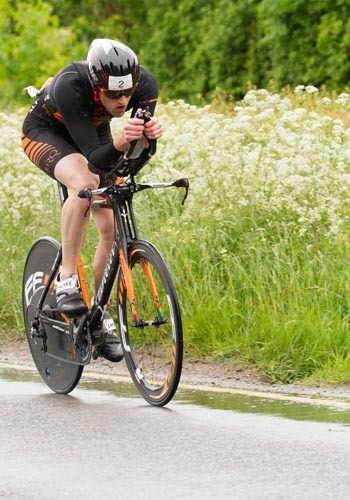 My first race of 2015 was the Bosworth Standard Distance Triathlon. 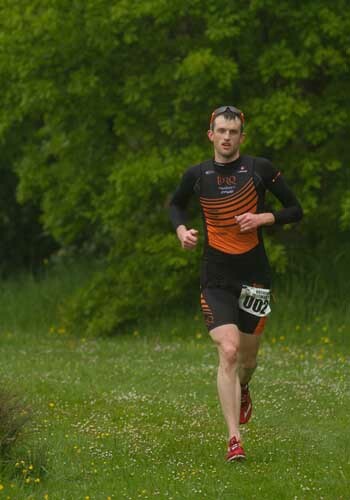 It was a 1500m lake swim, 42k bike and a 10k run. The race information stated that the run was to be 4 laps long and on a hard trail, with 200m per lap on grass. Later this turned out not to be the case! The weather was typically British. Throughout the race, I was certainly wondering when the Summer may finally arrive! It was 11 degrees, windy and there was a constant drizzle. I got in the lake for a brief warm up and noted that the lake was actually warmer than the air temperature! A few minutes later, the race started. I surged away from the start, to get clear water and soon found myself in plenty of space. I settled into a good rhythm and the swim soon passed. 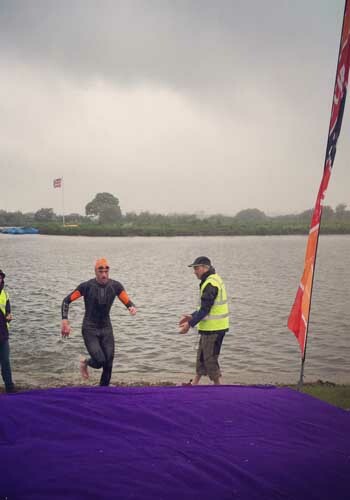 I exited the swim with the fastest Male swim of the day and ran across the 300m to transition. 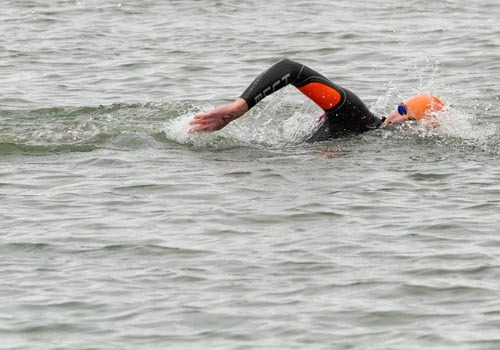 The swim seemed a little longer than 1500m, but that didn’t bother me at all! As I mounted the bike for the 42K, the rain was really starting to fall quite heavily. The roads were wet, with lots of standing water – not to mention the blustery wind, which made the bike section rather treacherous. The course was two laps in length, with a few undulations and some very fast sections. The first lap went by quite quickly, as I whizzed past the lake to start the second lap, I was still holding the lead with no one in sight behind. The second lap seemed more of a struggle, with the wind on one uphill section in particular. 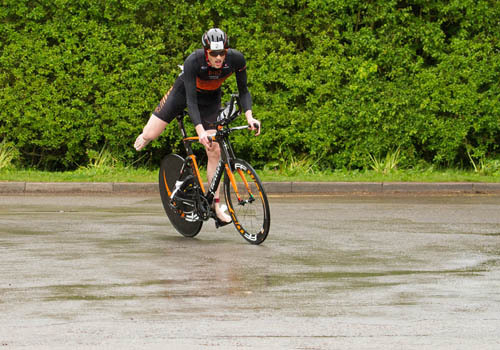 Nevertheless, I stayed as aero as I could and ploughed on, occasionally checking for competitors behind. As I turned to transition to dismount for the run, there was still no one in view. I pride myself on my quick transitions and today was no different. I had the equal fastest T1 and the fastest T2 out of everyone. Onto the run and I soon discovered that the pre-race information was incorrect. All of the run was on wet grass, which in places was very uneven. Not good for a flat tarmac lover! During the first lap, my quads began to cramp and I had to ease off a little to prevent it from getting worse. 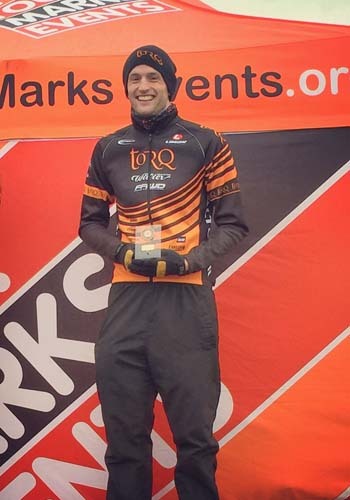 I often get quad cramp in the first race of the year, even with a good number of hard brick sessions done, when in training, nothing can quite recreate a true race situation. On each lap there was a dead turn, this allowed me to see where my competitors were. At about 400m after the turn, another athlete ran the other way. I figured I had around a 2 minute 30 lead. I tried not to show my discomfort (from my cramping quads), as he went the other way. At the end of each lap, I had support from my rather loud family members – which did help to speed me along. The question was, would I be able to hold off the closing currently 2nd placed athlete? With each kilometer covered, 2nd place was creeping closer. I was finally caught with only 2k to go. I tried to respond, but my legs had no more speed to give. I continued on and managed to increase my speed a little in the last few hundred metres – crossing the line 2nd Overall and taking the Age Group Victory. On the whole, I was pleased with my first Tri of 2015. Plenty to take away for the next race of the year. Thanks to Martin Landy and Kirsten Shaw for the photos.